Thanks to Apple software called Boot Camp, you can run both Windows (XP or Vista) and OS X on one Mac machine. 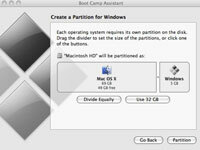 Here’s how to install Boot Camp, which came with Leopard, so you can use both Windows and OS X, interchangeably. 1Run Boot Camp Assistant (in the Utilities folder under Applications) to make sure that you have the latest firmware on your computer. You can find any updates at the Apple Web site. Follow any on-screen instructions if you’re updating the firmware. If you’re using a portable computer, make sure to connect the power adapter. 2Create a partition for Windows XP or Vista. This partition must be at least 5GB and can be as large as the total free disc space on hand minus 5GB. If you don’t plan on doing much in Windows, keep the XP or Vista partition small. If you plan on running graphics-heavy games and a lot of Windows programs, you might devote a larger amount to Windows. Drag the divider to set the partitions for both OS X and Windows. Or click Divide Equally to make equal partitions. Still another option: Click 32GB to devote that much to Windows. 3Insert the Windows CD. Click Start Installation. If you exited Boot Camp Assistant before installing Windows, open it again, choose Start the Windows Installer, and click Continue. 4When asked to choose the Windows partition, select C: if you’re running Windows XP or select Disk 0 Partition 3 BOOTCAMP if you are running Vista. This is important. Failure to do so could wipe out your entire Mac OS X startup disk. For Windows XP, format the partition in either the NTFS file system or FAT. FAT provides better compatibility between the two operating systems but is available only if the partition you created for Windows is 32GB or smaller; NTFS is more reliable and secure, but you won’t be able to save files to Windows from Mac OS X. For Vista, format the partition using NTFS. Click Drive Options (Advanced), click Format, and then click OK. Click Next. 6After Windows is installed, eject the Windows disc. You can do so by going to My Computer, selecting the optical drive (D:), and clicking Eject This Disk in the Systems Task list. 7Insert the Leopard installation disc and follow the on-screen instructions. You’re loading Boot Camp drivers so that Windows recognizes AirPort, Bluetooth, the iSight camera, the Eject key on the Mac keyboard, networking, audio, graphics, and so on. A Boot Camp control panel for Windows and an Apple Boot Camp system tray item will be added. 8When you see the message that the software has not passed Windows Logo testing, click Continue Anyway. Don’t cancel any driver installers. The computer will restart. 9Follow any Found New Hardware instructions. As with any new Windows computer, Microsoft requires that you activate your XP or Vista software within 30 days.